Hey there, dear friends! Did you know that out of all of your wedding vendors, your photographer and videographer are the two that you’ll be spending most of your day with? Today we’re sharing about why engagement sessions are so important to have done before your wedding day. We include these sessions in all of our photo collections for several reasons. You can read why we feel so strongly about them down below. We are so passionate about getting to know our couples on a personal level! 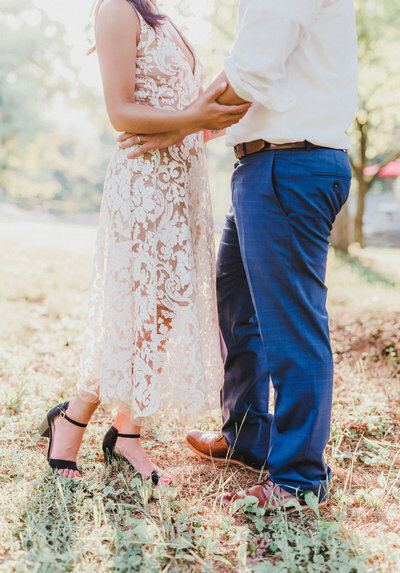 We care more about making a connection with them than knowing what song the bride will be walking to down the aisle or what kind of cake they’re going to share with their guests (cake is important, don’t get us wrong!). Sure, their wedding details are important to know during the planning process, but we value the connection we have with them more. Once we make that connection, we’ve all made new friends for life! You’ll feel so comfortable and relaxed on your wedding day and you won’t feel like there’s a stranger capturing the most beautiful day of your lives. You’ll feel much more confident in front of our cameras, which allows us to get tons more portraits in a small amount of time. The images will be a true reflection of who you are as a couple! Our time together during the engagement session is so crucial to us learning how you interact, and allows us to capture the most genuine pictures of you on your wedding day because we’ve already captured you together. Feeling nervous? You’re not alone! We often hear about how “awkward” our couples feel being in front of the camera, but you can rest assured knowing that we’re going to have lots of fun and those nerves will fade in no time. Be prepared to laugh a lot, cuddle, tickle, kiss, and just be in love! This exciting chapter of your lives deserves to be documented just as much as the wedding day! Your engagement session is totally unique to you, just like your wedding. When planning the session, we always ask if our couples have a location that’s dear to their hearts, like where they had their first date, or where they often go together while they’re out. We always encourage our couples to add elements of who they are to the session to make it special. This is a great opportunity for you to truly show who you are and what you love to do together. From the location to coordinating outfits to any props or little details added to the pictures, it is totally about you. This is your love story, and you’re GETTING MARRIED!!! Many of our brides choose to have their hair and make-up professionally done for their wedding day. What better opportunity to have a trial done on the same day as your engagement session! This will serve as a preview of what you’ll look like on camera on the wedding day. Plus, you’ll come to the session feeling more confident and beautiful as ever. You’re all dolled up for the engagement session, so why not plan to go out for dinner and drinks afterwards?! Savor that beautiful hair & make-up and those fancy outfits! The photos from your engagement session can be used for your save-the-dates, which get sent out 6-8 months prior to your wedding day. They can also be used in a guestbook for the ceremony or as prints to show off at the reception. We’d love to get to know you and your story! We are currently only accepting a few more weddings for 2019 and booking into 2020, so give us a call at (717) 422-6857 or email us at hello@soulfocusmedia.com to set up your consultation.